Someone asked Elon Musk for it a few days ago on Twitter, but seems like it was already in the works — ‘Chill Mode’ is officially here for Tesla Model 3 owners with the 2018.14.1 over-the-air software update. ‘Chill Mode’ adds a less aggressive acceleration mode than the standard mode which makes a lot of sense in the urban stop-and-go traffic. Tesla’s ‘chill mode’ doesn’t seem to be same as the ‘Eco Mode’ that some other manufacturers offer for fuel/range savings. The reason it being not equal to ‘Eco Mode’ is that many Tesla Model S and X drivers using it for sometime don’t report a significant increase in range but it offers a ‘smoother more gentler’ driving experience as Tesla calls it in the release notes (screen-shot and text release notes below). We included a test video below of the ‘Chill Mode’ performed by famous Tesla/EV evangelist ‘Bjørn Nyland’ on his Tesla Model X P90DL to get an idea of how it actually affects the driving experience. Tesla Model 3 Chill Mode release notes - shared by 'u/geniuzdesign' from Tesla Subreddit. 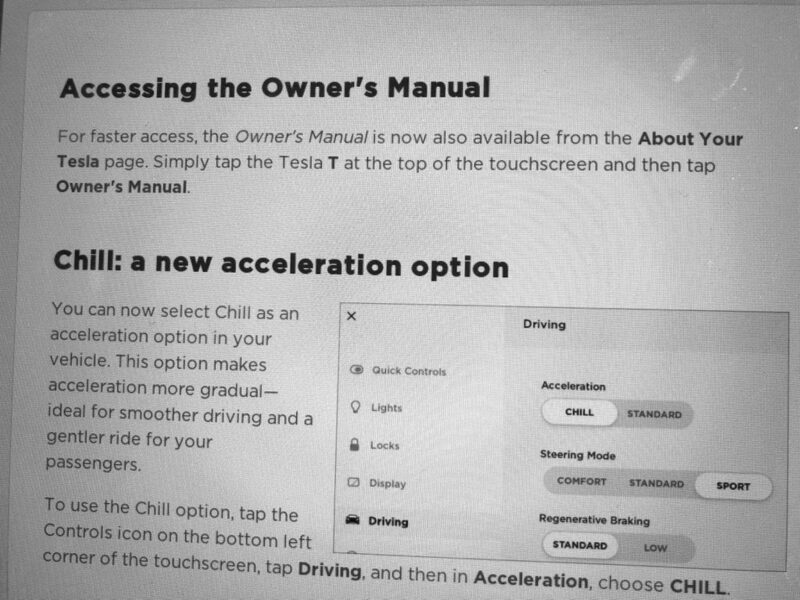 You can now select Chill as an acceleration option in your vehicle. This option makes acceleration more gradual — ideal for smoother driving and a gentler ride for your passengers.